Yarn Tails: A Waffling We Will Go . . . 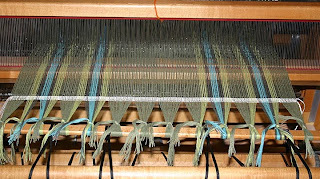 The waffle weave towels are on the loom - finally. Seems like it's taken an unusually long time to get these warped, between changing out the heddles, working with finer threads (8/2 cotton) and taking a hiatus while Addy and Rachel were here. 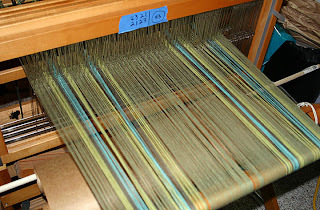 The threading pattern was simple - an 8-thread repeat - but it gave me fits off and on across the entire 402 thread warp. 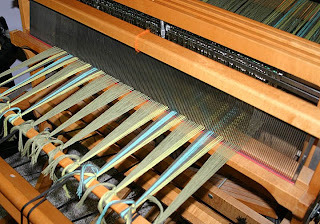 Tomorrow the pattern weaving begins. Cross your fingers for me.